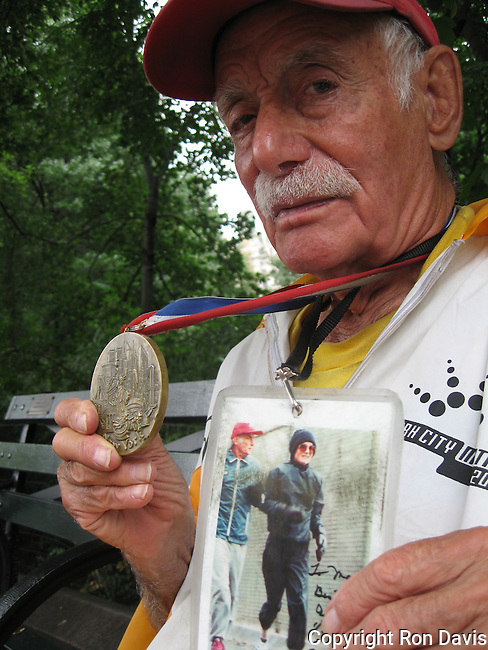 Alberto Arroyo was known as "the Mayor of Central Park for 70 years". He was awarded the prestigious Medal For Overcoming Adversity. This photo was taken in Central Park, NYC, June '06. Mr. Arroyo passed away in 2010 at the age of 94 years. A former boxer from Puerto Rico, Arroyo had taken to running in Central Park along the bridle path, but after a police officer told him he was bothering the horses, Arroyo ran around the reservoir. That was 1937. Arroyo also used to run during his lunch hour while working at Bethlehem Steel in Battery Park, which was unheard of back then, and ran in the first NYC marathon. In more recent years, Arroyo would walk clockwise around the reservoir with a walker, greeting runners and offering them encouragement. He was even given a State Senate resolution in 1985, acknowledging his 50 years of running and calling him one of the "pioneers of the jogging trend."